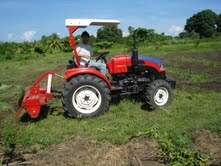 Screw local ownership and appropriate technology--give me a white guy on a Chinese tractor to get the job done! Submitted by Greg Vaughan. Find him blogging at Agrarian Ideas for a Developing World. As an EAW, nothing imbues you with cynicism-tinged street cred like the adoption of mildly conservative ideas. You will, of course, retain some of your idealism and belief in humanity, but it will now be informed by a hard-nosed pragmatism borne of your years of experience. Yours will be a strategic idealism that grants you immense field cred. You will thus become a romantic figure, disappointed by the shortcomings of human beings, but striving on in your world-saving mission in spite of it all. Whatever the cause of your flirtations with reactionary thinking, you are demonstrating an admirable capacity to go outside the box and challenge the progressive mores of your EAW colleagues. Care must be taken, however, to nuance your stances so as to separate them from First-World-based talking heads like Paul “Sweatshops for Haiti” Collier or Bill “Hook African Farmers on Imported Fertilizer” Gates. These ideologues are ignorant of the realities on the ground, unlike you, and consequently paint with excessively broad brush strokes. Your newfound conservatism should not take on tones of cultural or racial superiority, lest you be confused with a rigid-thinking new arrival, or worse yet, an Evangelical missionary. It must be clear that your cynicism is an evolution beyond the normal EAW’s natural liberal leanings, not merely an unconsidered initial state. To help you along your ideological transition, it is useful to have an authentic local friend to provide moral support and credibility to your conservative ideas. Usually this friend will belong to an important family whose economic and political fortune has been made precisely by advancing the exploitative, oppressive agenda he is now helping you to understand. Love this. It’s just perfect! How is this right-leaning? E.g. cultural relativism can be seen throughout the spectrum of political right-to-leftness and using third-world solidarity as an argument is originally a left-wing concept. That’s why it’s so funny–cultural relativism and solidarity arising from progressive values can lead one to accept or even support reactionary values in other cultural contexts. This is an excellent article…particularly as I found myself discussing (and agreeing) how “the International Criminal Court is just an idealised, Western institution which only makes things worse for local people” with some African colleagues the other day. Not to say this point of view is wrong, or right, but the article is a good wake-up call for me to keep thinking outside the box, both the EAW box and the pure local context box… Thanks.